Phrasal verbs make many students feel hopeless. Even advanced students struggle with them and to be honest, I am not very comfortable with them either. Moreover, they seem very hard to memorise. That is why I have prepared the following post. There is a story where all the verbs are used. Thus you can see them in context. Then you should read and listen to the story again and complete the mind map with the phrasal verbs from the story. In the end you can practise the verbs in a quiz. Watch and listen to the story and then answer the comprehension questions in the game. Now answer the comprehension questions in the following game called On target. If you answer the questions correctly you should shoot as many bad ducks as possible. Don’t forget that you can get a bonus if you shoot any of the bottles on the walls. 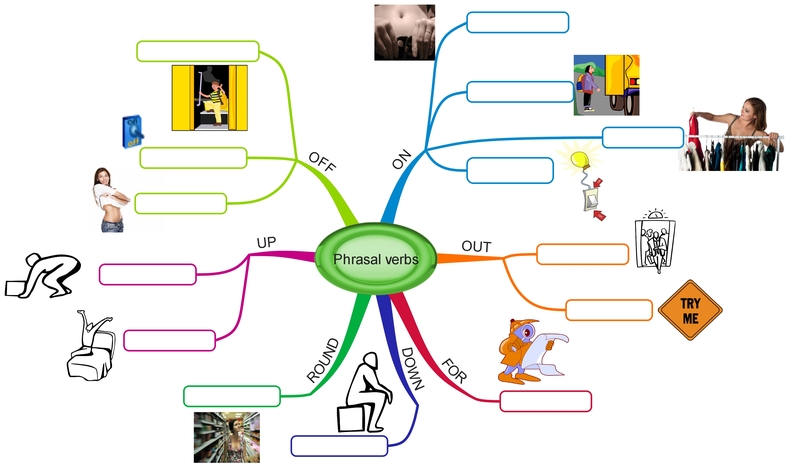 Print out the following mind map and try to complete it with the phrasal verbs from the story. Complete the mind map with the phrasal verbs from the story. Now it is time to practise the phrasal verbs in a quiz. If you complete the quiz successfully you will have an opportunity to play the game Hot race. We have already published two posts on phrasal verbs here. The first one is called Phrasal verbs – Fred and Betty and you can see it be clicking here. There is an animated story and several exercises to memorise 12 phrasal verbs. The other post deals with phrasal verbs from a slightly different point of view. It is called Phrasal verbs separable or non-separable and it explains which phrasal verbs stick together and which can be separated.